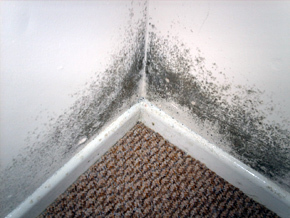 We were asked by a housing association to investigate dampness in some of their tenanted properties. It was thought that previous injected cavity fill had bridged the cavities and had allowed moisture penetration to the inside. We needed to ascertain the internal environment conditions to ensure there was adequate heating and ventilation. We also undertook masonry sample drilling to identity the moisture content profile through the wall and also a thermal imaging survey to identify condensation and cold bridging. The property had been decorated before the new tenants lease commenced. 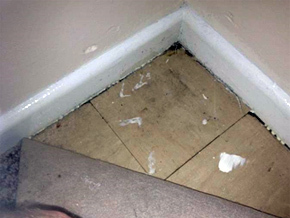 The housing association had been quoted in excess of £5000.00 to remove the existing cavity fill from a one bedroom flat. During our site survey we noted that moisture was running down the walls and on the floors. We undertook environmental monitoring with data loggers, drilled masonry samples for analysis and used a thermal imaging camera to determine surface temperatures. The results of our masonry sampling drilling investigation showed the moisture profile through the wall and that moisture was not being transferred through the wall across the cavity by the insulation. Thermal survey identifying a cold bridge and identifies the area where condensation was occuring. It was possible to conclude that the result of moisture noted on the floors and walls was condensation. 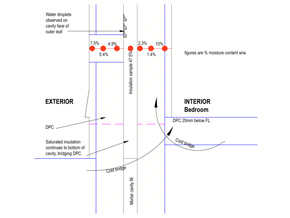 Environmental monitoring of the air temperature and relative humidity and the wall surface temperature confirmed these findings and showed in this case, although there was sufficient heating there was inadequate ventilation. Suitable continuous running extract fans with a boost when the room was used together with an intelligent humidistat were installed. On completion of our investigations the tenant gave us this photograph, which shows the line of mould prior to their occupation and painting of the property. Compare the line of mould to the cold surface in the thermal image above.